The story revolves around Ebenezer Blackadder, a very kindly man who runs a moustache shop. He is the only (i believe) Blackadder in the3 show's history to not be named Edmund. Also, it is important to note he is the only one who was nice. He is actually nice to a fault. Everyone takes advantage of him. 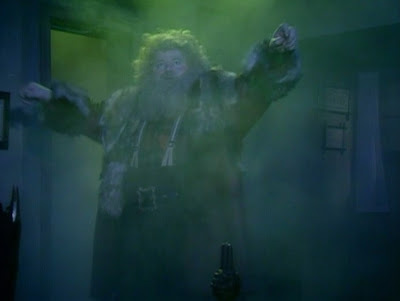 Then, on Christmas Eve, he is visited by the Spirit of Christmas, who has come by while making his rounds to the misers who need to change their ways. He tells Ebenezer that he has nothing to worry about since he is such a good man already. 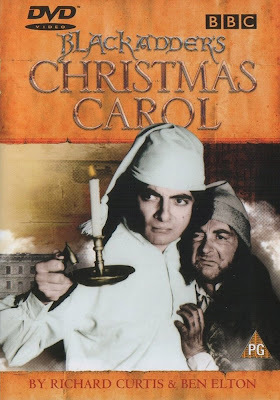 One thing leads to another and the Spirit of Christmas shows Ebenezer his ancestors and what big douchebags they were. Ebenezer is intrigued by this, and asks to be shown what would happen if he were to become like his ancestors. We get a great look at what his descendant will be like (no spoilers here), and decided to be a bad guy from now on. This special is quite a refreshing look at the classic tale of A Christmas Carol, and it is hilarious, to boot! There is a bit about a Nativity play being performed, and how they had to use a dog for baby Jesus. They also used dogs for the sheep, and the baby Jesus dog ran off to try and mount them. If you like Rowan Atkinson and quirky British humor, this would be worth checking out. Tonight's song is the best rendition of the 12 Days of Christmas.